This is another one of our requested muffins. This is a great easy to make muffin. These do store nicely if you want to make them for breakfast for school, or whatever. Enjoy these chocolately muffins with a great big glass of milk. 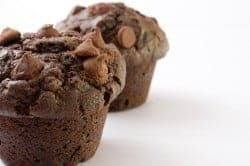 You can make the Dolly Madison Double Chocolate Mega Muffins at home. Mix cake mix, pudding, water, eggs, oil, and almond extract until smooth. Stir in chocolate chips last, blend through. Fill muffin cups 3/4 full and bake in preheated oven at 350 degrees between 25-35 minutes until done, but do not over cook. This will depend on the size of the muffin cups. I like to make six very large muffins and 12 smaller ones for the timid. These are delicious! And they freeze well! I appreciate the heads up! People always ask me about how stuff freezes. These are amazing! Everyone loved them. They are quite simple to put together and were an immediate favorite.